In this photo, my high school friend Greg gets kicked in the face by ….er…. it looks like Will but it’s hard to tell from this angle. Photo is taken in front of Andy’s house in Elko. Dan is in the background with Andy’s car. BTW: if anybody knows how to contact Greg, or has heard from him in the past 10 years, you should let me know. Google, the source of all knowledge, seems unable to locate him. 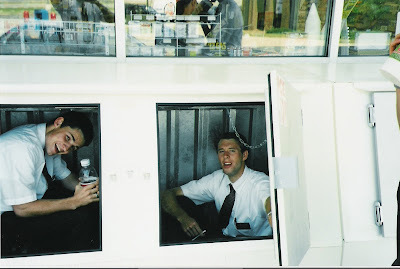 Elders Fackrell & Collins seeking shelter from the heat in an ice chest in front of a gas station in Elyria, OH. Photo probably taken during the summer of 2002. 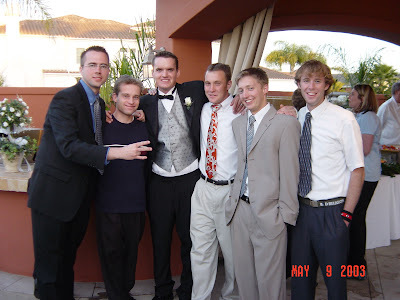 This photo is from Shaun’s wedding reception, which, according to the date on the photo, was on May 9th, 2003. Pictured here are Nils, Alex, Shaun, Scott, Ryan, and me. We met at BYU in 1999 in the dorms. Author Posted on August 23, 2008 Tags photo archives4 Comments on From the Archives….